Turkmen women are complaining that the police are taking away their driving licences on spurious grounds, amid reports that the Central Asian country has quietly banned women from driving altogether. Since the weekend, groups of four traffic police have been routinely pulling over female drivers at the busiest junctions in the capital Ashgabat and searching their cars for any reason to take them off the road, according to Chronicles of Turkmenistan, a prominent opposition news site. "The officers don't mention any ban on women drivers, but look carefully for reasons to tow the cars off to the pound," witnesses told the site. "A missing first-aid kit, fire extinguisher, spare wheel, tyre jack or warning triangle is enough to have the car impounded. If the woman owner refuses to have the car towed away herself, the police call a breakdown lorry to do the job," Chronicles says. Witnesses reported up to 20 cars lined up along Independence and Neutrality Avenues at a time while their women drivers waited for the police inspection, estimating that 90-120 vehicles were impounded on one day alone. "Those affected believe the action is aimed at persuading women to give up driving," the news site said. The Turkmen service of US-backed Radio Liberty reported similar incidents on Saparmyrat Turkmenbasy Avenue in Ashgabat, complete with surreptitiously-taken photographs. The police have not mentioned any blanket ban on female drivers, but a witness told Radio Liberty's correspondent that one officer said "we've been given an order that women aren't to drive down major roads in the city". The correspondent said the unpublished ban applies to policewomen too. One female officer told Radio Liberty that "last week all women in law-enforcement were told not to drive anywhere - we have to leave our cars at the station, and on no account take the wheel". Women have been complaining for more than a year of discrimination in driving tests, according to Chronicles of Turkmenistan. The country has a reputation for arbitrary if unevenly-enforced rules about public conduct, from growing beards to installing air conditioners, under both founding President Saparmyrat Nyyazow and his marginally less eccentric successor Gurbanguly Berdimuhamedow. The Chronicles site notes the usual pattern with these exclusively verbal orders - "Enforcement is strict once the order is given, then gradually tails off until another order is issued". It is not clear who initiates these bans, let alone why, but President Berdimuhamedow is a keen driver and pays particular attention to traffic regulations. For example, a ban on black cars dating back four years was revived last month, according to the Alternative News from Turkmenistan (ANT) site. Interior Minister Isgender Mulikow accused women drivers of being the cause of most traffic accidents when he presented his annual report to Mr Berdimuhamedow in December, prompting the president to order him to "fix the situation", according to an ANT police source. 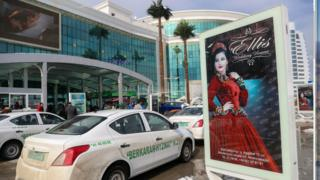 Both ANT and Chronicles of Turkmenistan say the black-car ban is also down to presidential caprice. "The president has shown a preference for the colour white for many years," ANT's source said, while Chronicles put it down to Mr Berdimuhamedov's alleged "superstitious belief that white brings luck".